Long ago, after seeing the suffering of beings in the six realms, compassion arose in the minds of all buddhas. 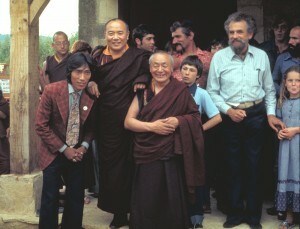 In order to free all beings from the suffering of countless rebirths in the circle of conditioned existence, they gathered and prayed for the merit of beings to ripen so that they might be liberated from their obscurations and unskillful actions of body, speech and mind, the perfect, deep and clear meditative absorption took place and Karmapa, emanation of the Great Compassionate One, Lord Chenrezig, was named and thus appeared on earth. From the first incarnation, Dusum Kyenpa, down to the present incarnatation, Rangjung Rikpi Dorje, the Karmapas have shown themselves continuously. 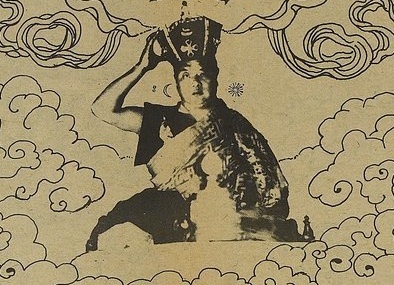 In the past, countless numbers of buddhas have manifested throughout the ten directions of space, showing to beings the holy teachings of the enlightened ones. In the present Dharma Age we are under the guidance of the teachings given by Shakyamuni Buddha. In the future, the Wheel of the Dharma will be turned by His Holiness Karmapa, who will then be known as the Buddha Drugpa Sinjay. The precious Guru Padmasambhava has said, and in my opinion it is true that if one sees the face of the Karmapa, or hears his voice, unimaginable defilements and obscurations are removed and rebirth in the lower realms is prevented. All of the above quotations were not spoken by just anyone, but were very clearly stated by Shakyamunl Buddha himself. I think it is therefore important for us to know that this enlightened being will be coming to Dhagpo Kagyu Ling, France in a few months, For those with no knowledge of dharma, and, for the benefit of all beings, I have written these few lines so that all may have the opportunity to see His Holiness and to clearly understand the nature and the power of the blessings his presence will convey. If one sees the face of Karmapa, one is sure to be purified from all unskillful actions of the past. It is of very great importance to have confidence and that is why I’ve written this short paper. This entry was posted on Sunday, September 25th, 2011 at 10:50 pm and is filed under 16th Karmapa. You can follow any responses to this entry through the RSS 2.0 feed. You can leave a response, or trackback from your own site.